The Tilt’n Turner is a Mount'n Mover Arm with all the benefits of rotation, angle adjustment and device support via and adapter and Quick Release Plate however it sits atop a Mount'n Mover pole and does not really have an “arm”. As it's name suggests, it only Tilts and Turns. The Tilt’n Turner can be rotated, the angle adjusted, and any device equipped with a Quick Release Plate can attach to it. It does not really have an “arm”. 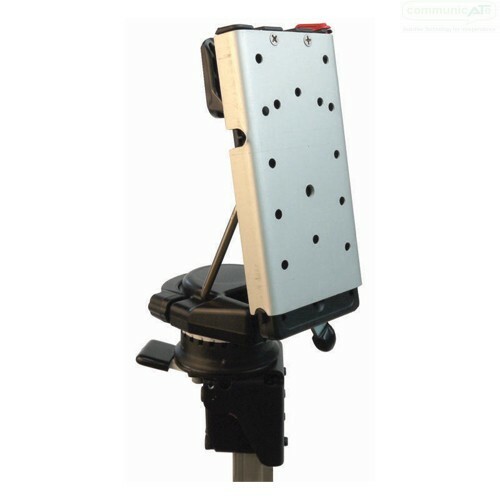 It has a small footprint and is useful for positioning devices at a specific angle and height. It can be used in conjunction with another Mount'n Mover Arm, whether that be a Dual Arm or a Single Arm, by attaching Tilt'n Turner to the top of the post if the post extends up above the Arm. 0 cm from shoulder to wrist joint as there is no "Arm"
Only accessible on the side of the wheelchair to which it is mounted. dependent upon what's required - from 12" to 24"